Want to draw a massive crowd? Park two or three food trucks near one another and wait a minute. That appeared to be the formula Feb. 8 at the Royal Oak Farmers Market, where Detroit’s food truck elite held court, cranking out their delicious wares, all while supporting local charities. And if you needed an indicator that speaks to the enormity of the food truck craze, look no further than the gleam in the eyes of the estimated 3,000 who showed up to chow down. That turnout towered over expectations, so much so, that organizers have indicated that you’ll definitely be seeing more food truck throwdowns in metro Detroit. The event is called Street Eats Wednesday, where some of the biggest food truck names in the area parked inside of the market and got busy. 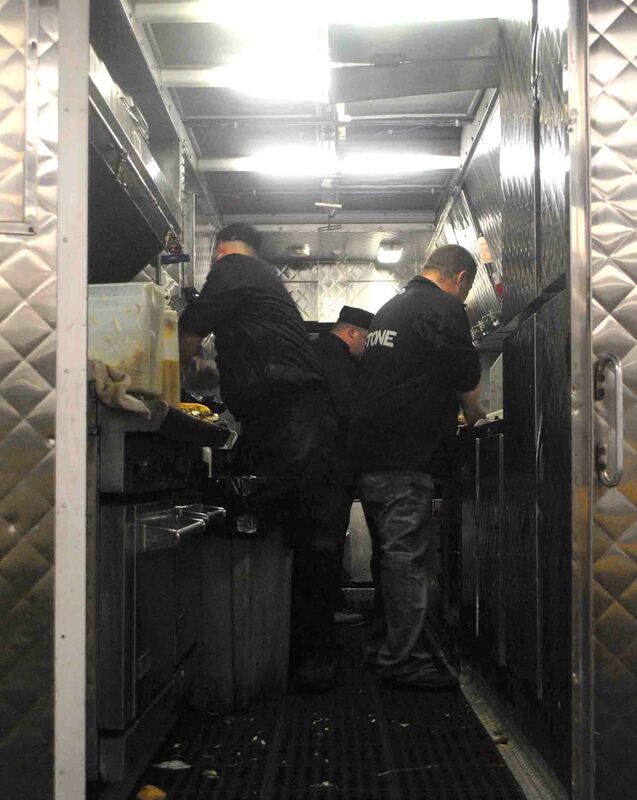 The Feb. 8 event was the inaugural Street Eats Wednesday and was put together by the Michigan Mobile Food Vendors Association. The hype really began earlier in the day, as links to the event started showing up on social networking sites like Facebook and Twitter. It generated such a heady buzz, that lengthy lines eventually snaked everywhere inside of the market. Half of the market’s interior space was closed off but the event arguably could have used all of the facility’s 20,000 square feet. 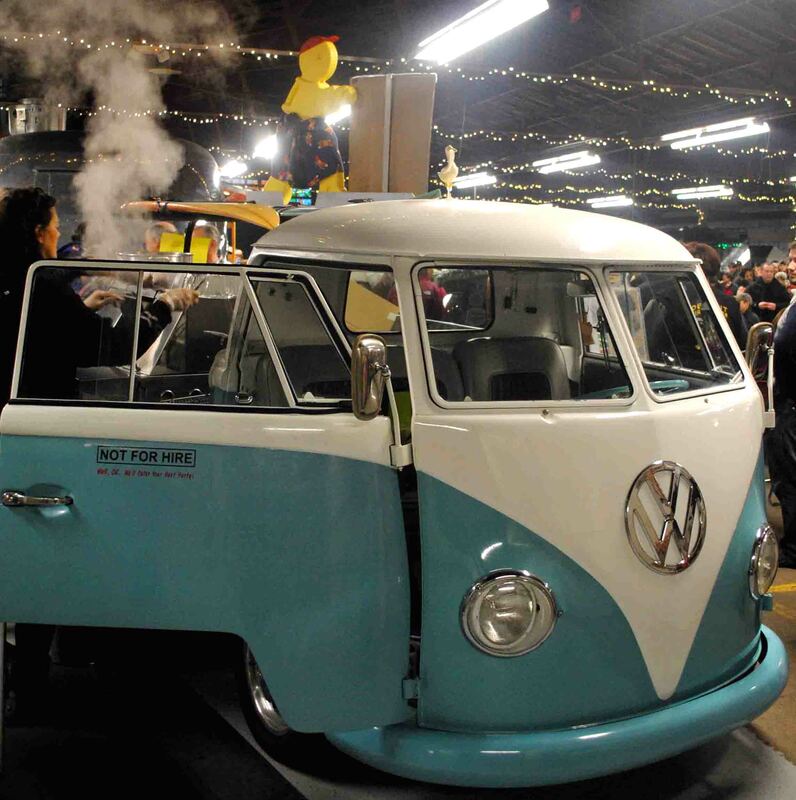 There, food truck all-stars like El Guapo Fresh Mexican Grill, Jacques’ Tacos, Franks Anatra, Ned’s Travelburger, Taco Mama, Concrete Cuisine, Chow Catering and Treat Dreams occupied indoor space among some seating and live music by the Reefermen. Concrete Cuisine’s truck was stationed outside at the West entrance, because it was too big to get through the doors. We knocked out a couple of their deep-fried pickles. And apparently, we weren’t alone. Being relegated to the outside had no impact on Concrete Cuisine. They sold out of food before the event was done. And they weren’t the only ones. Nearly every food truck vendor eventually sold out. Evidently, you could park a food truck in a landfill and it would still have a line. It was painfully crowded inside of the market and as the event continued (it ran from 5 p.m.-9 p.m.), it looked like the flow of people coming to the admission-free event wasn’t about to stop. We chatted with Basil Loizonopolis, owner of Franks Anatra, the cleverly named hot dog (among other things) truck that is also a beautifully restored 1965 VW truck. That spotless, aqua blue rig looked pretty nice parked next to the Ned’s Travelburger truck, itself a 1946 Spartan Trailer. 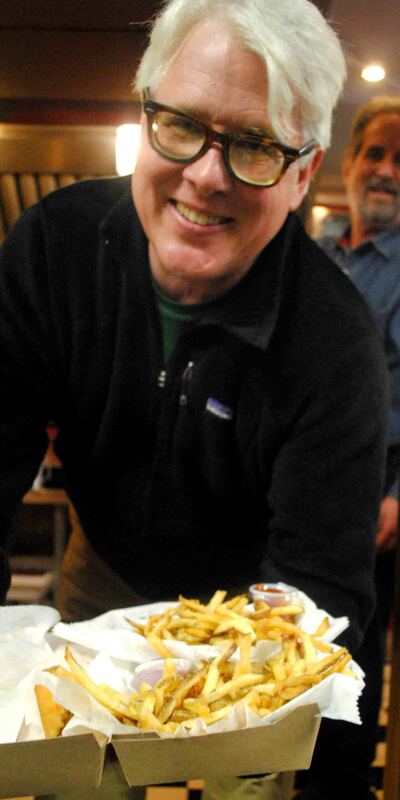 We don’t know what looked better: all of that chrome or the food. Loizonopolis barely left his truck all night, as customers lined up for his meatball sandwiches and Italian sausages. His crew never seemed to stop moving. “It was fun, man,” he said. “We’re feeling the pain today. It got crazier as the night went on. It’s just a great experience. We reminisce about it the next day, like we were at a wedding reception. Carl Patron, owner of Ned’s Travelburger, agreed that the food truck gathering was something special, and it didn’t need to sell a drop of alcohol to do so. Oh, and they had their pick of different food. And if by “different,” Patron meant “delicious,” then we agree. Folks thrilled to everything from pulled pork by Chow Catering to braised short ribs tacos at Jacques’ Tacos; or you could walk a few feet, past the Reefermen’s live acoustic set, over to Taco Mama for some Mexican jambalaya or some jalapeno beef sliders. Treat Dreams had a little tent in the middle of the market. 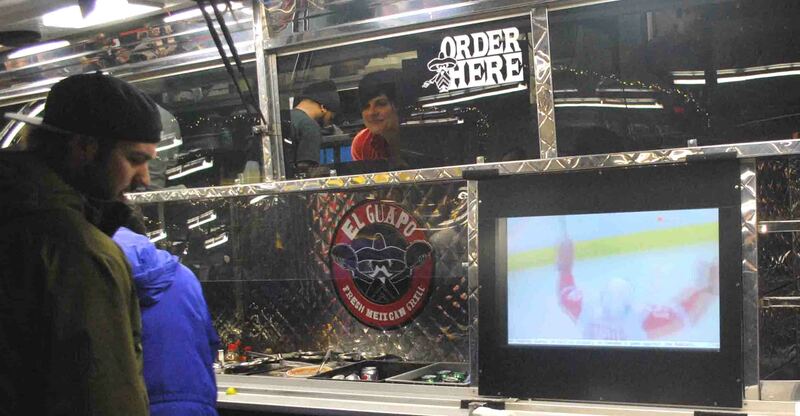 El Guapo’s two truck-mounted flat screen TVs showed the Red Wings-Oilers game. An estimated 3,000 people came through the doors. Tips were donated to an array of charities, including Focus: Hope, Forgotten Harvest, Camp Casey, the Humane Society and others. Patron said the association will meet next week to follow-up and plan for the future. Street Eats Wednesday was such a success, threw such an enthusiastic vibe and created such a rich memory for those involved, that he says it only makes sense to keep doing it. He said truck owners will tap into their geographic strongholds as a way to possibly determine future venues. Concrete Cuisine has a strong presence in the Novi-Farmington area, so one might occur on that side of town; Jacques Tacos is more dialed in to Ferndale and Royal Oak, Patron said. And with more Street Eats Wednesdays hopefully on the way, spring and summer just started looking much better.